U.S. industrial production increased 0.3 percent in December, led by the biggest surge in manufacturing in ten months. The Federal Reserve said Friday that that manufacturing output jumped 1.1 percent last month, the largest gain since February 2018. Automakers drove much of the growth with a 4.7 percent jump in production. Utility output slumped 6.3 percent amid an unseasonably warm December. Mining output rose 1.5 percent on increased extraction of oil and natural gas. Overall industrial production is up 4 percent from a year ago. "This was a solid report and a good finish to 2018," said Jennifer Lee, a senior economist at BMO Capital Markets. The manufacturing sector was also using more of capacity, a sign that companies might need to invest more in equipment and facilities. Capacity utilization at factories increased 0.7 points to 76.5 percent, a solid increase though that's two points below the long-term average. Manufacturers have benefited from a relatively healthy economy, despite concerns about a global slowdown, a trade war between the United States and China and the waning stimulus from President Donald Trump's tax cuts. Auto sales improved 0.3 percent in 2018 to 17.27 million vehicles sold. Yet there are also signs that manufacturers might struggle to keep expanding. 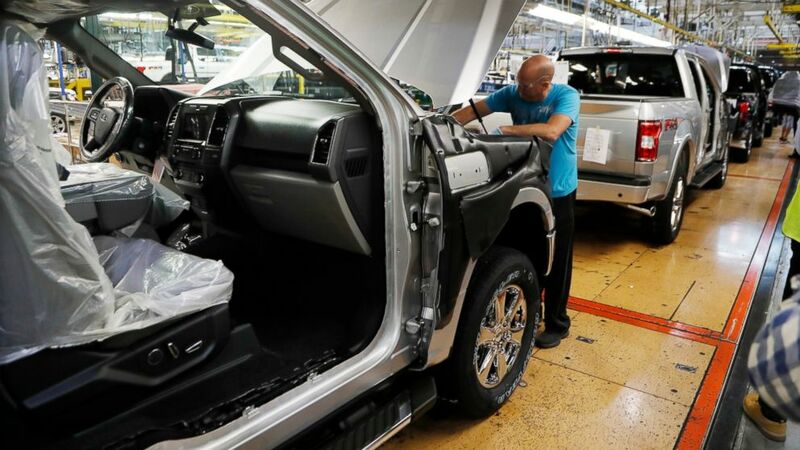 The Institute for Supply Management, an association of purchasing managers, said earlier this month that U.S. factories expanded at the weakest pace since November 2016. The survey-based index fell to 54.1 in December, a decline from 59.3 in November. Still, any reading above 50 points to continued growth.